We are looking for a way to insert DNA into a genome, but we would like to do it in a way that the recognition site stay intact to be able to add again DNA at the same location. Do you know if it is possible or if it is already the way CRISPR/Cas9 does it? Apparently multiple systems were already engineered but the few papers we read weren't about our problem. Look into site-specific recombination. You can use a site-specific recombinase, specifically an integrase, that can insert a sequence of DNA at a certain attachment site. You can add an identical attachment site into the DNA sequence to insert, allowing for the reintegration of a new attachment site. Note however that you might get SSR onto the insertion plasmid itself, so don't do this if you need a specific amount of integration. Look at the bottom subfigure of A for an example of integration. 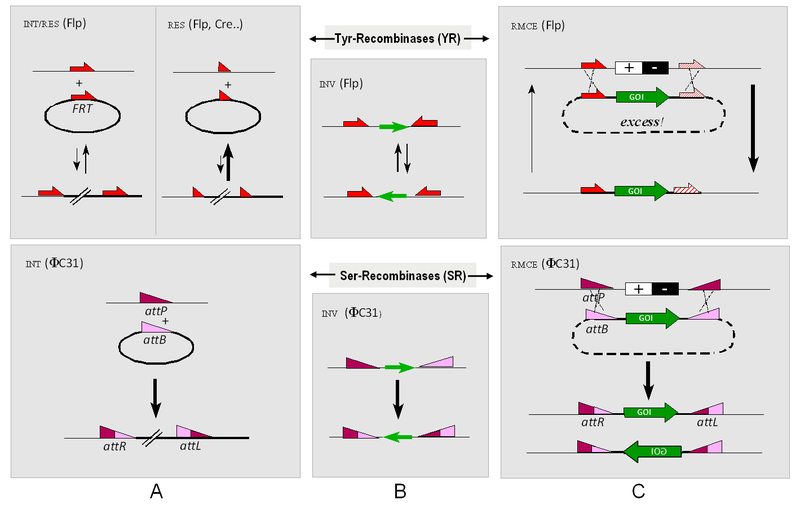 Recombinases can also do other things, such as excision and inversion, based on the orientation of the attachment sites. Not the answer you're looking for? Browse other questions tagged dna synthetic-biology or ask your own question.